RAW HOLLYWOOD : NEW MUSIC: DAVID GUETTA FEAT. NICKI MINAJ & LIL' WAYNE "LIGHT MY BODY UP"
NEW MUSIC: DAVID GUETTA FEAT. 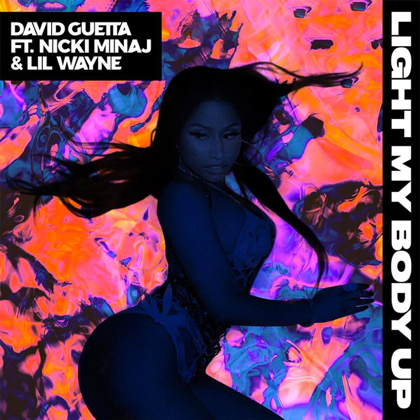 NICKI MINAJ & LIL' WAYNE "LIGHT MY BODY UP"
David Guetta enlists Nicki Minaj & Lil' Wayne for the hit in the making track "Light My Body Up". The vibrant dance/techno club track sees Minaj take the lead with singing vocals over the beat, but could she throwing more disses at Remy Ma? "I just started my sentence, like the capital letter. Got bars for years , I hope you send me a letter / No she'll never be queen, so now she got a vendetta / I ain't talkin' 'bout David, when I say I'ma Guetta."